I’ve never been much of a graphic novel fan, mainly because I prefer to have an author’s words ignite my imagination. That said, I thoroughly enjoyed the new collaboration by Mexico’s most highly regarded crime novelist, Paco Ignacio Taibo II, and the illustrator Eko. 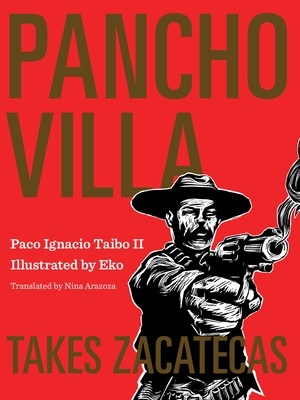 Pancho Villa Takes Zacatecas (published by Restless Books in an English translation by Nina Arazoza) celebrates so many things Mexican. For one, the 100th anniversary of the Battle of Zacatecas—the bloodiest engagement of the Mexican Revolution—which took place on June 23, 1914. Under the leadership of General Francisco “Pancho” Villa, the insurgent División del Norte fought the federal troops of President Victoriano Huerta. By routing Huerta’s army and taking the city’s strategic railroad junction, the revolutionaries forced Huerta’s resignation. Afterward, the Division of the North proceeded to Mexico City to meet Emiliano Zapata’s troops coming from the south. Villa’s victory was soon memorialized in the Mexican corrido, “La toma de zacatecas” (listen here). Paco Ignacio Taibo’s minimal text deploys a fictional character, Colonel Montejo, loosely based on a historical figure, to tell the story of Villa’s famous victory. In the U.S., Pancho Villa is remembered as the “bandit” who shot up and burned Columbus, New Mexico, killing eighteen people, which prompted President Wilson to send General John J. Pershing and 5000 troops into Chihuahua in pursuit. But in Mexico Villa is a revered revolutionary leader. 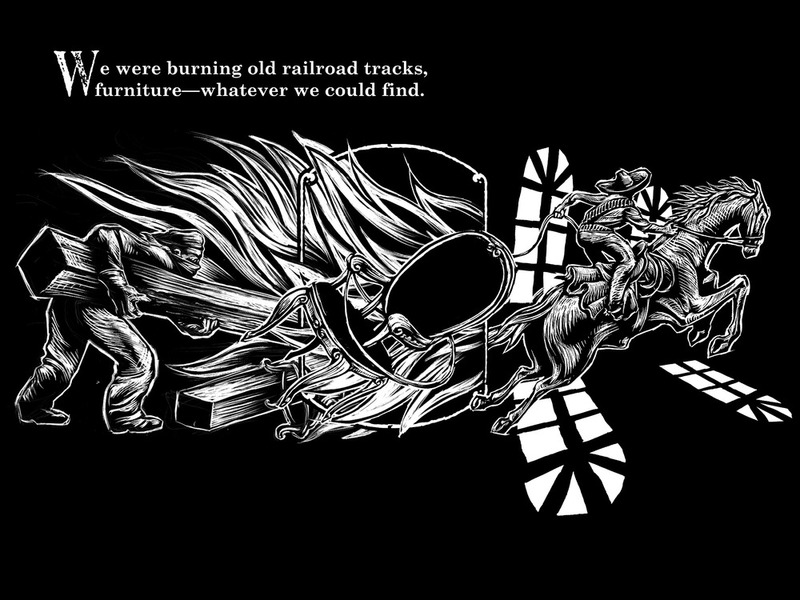 The illustrations by Eko are the most impressive aspect of this novel. I was unfamiliar with this Mexican artist, but it turns out he has done work for the New York Times, Frankfurter Allgemeine Zeitung, and other newspapers. Here, his inspiration comes from the great Mexican caricaturist, José Guadeloupe Posada. 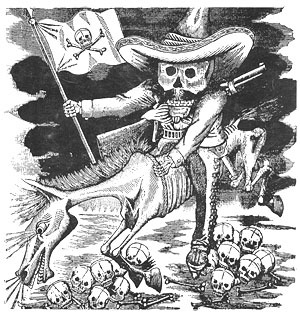 Posada used Day of the Dead calaveras to lampoon the political corruption at the height of the dictatorship of Porfirio Díaz and during the chaos that followed in the days of the revolution. Posada’s depiction of the Mexican Revolution. In Eko’s style there is also a nod to the great muralists of the Mexican Revolution: Orozco, Siqueiros, and Rivera, as can be seen in the page below. I was somewhat apprehensive buying a graphic novel as an eBook. On an old Kindle the illustrations are okay, but on an iPad they come through crisply, and the ability to enlarge them makes it even easier to admire their many fine details. In Seattle the leaves are turning. The big-leaf maples blaze in fiery tones and the alders, parched from a long dry summer, blanch from the cooler nights. In the Cascades the huckleberries rage crimson and the larches glow golden. Leaves litter the trails and swish underfoot. This time of year I like to brew up a strong pot of tea and turn to one of my favorite authors, Malcolm Lowry. Specifically, to one of his finest works, the novella The Forest Path to the Spring. 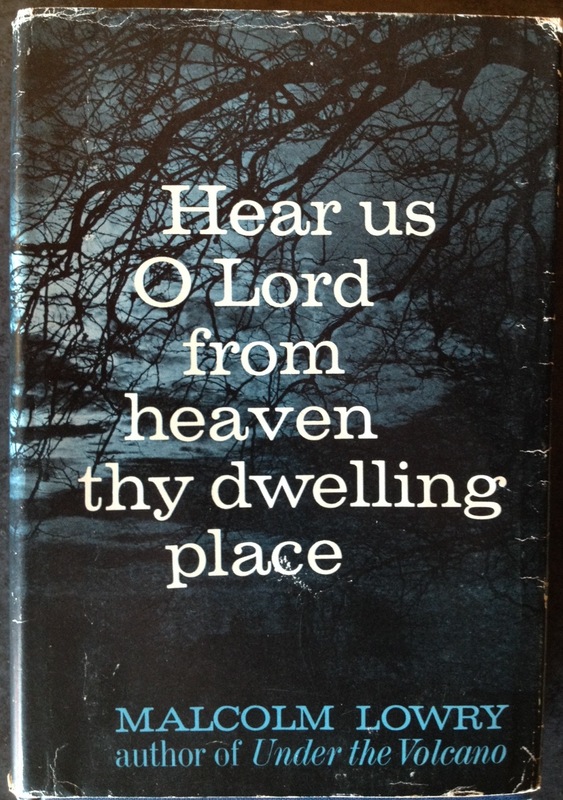 Published in the posthumous story collection Hear Us O Lord from Heaven Thy Dwelling Place, Lowry’s pastoral is full of lyrical language, classical allusions and keen observations on nature and self. 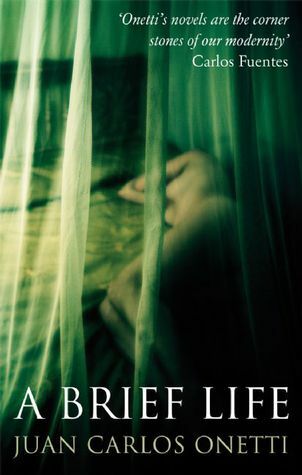 The plot is minimal, arising from Lowry’s life as a squatter in a shack on the Burrard Inlet, in Dollarton, near Vancouver, British Columbia. Lowry and his wife spent fourteen years there while he wrote his masterpiece, Under the Volcano. For Lowry, Dollarton represented paradise on earth, a place of bliss and creativity. His love for it shines throughout this quiet, mature work. If Under the Volcano is Lowry’s Inferno, The Forest Path to the Spring is his Paradiso. In fact, Lowry envisioned a series of six or seven novels titled The Voyage that Never Ends, and planned to use The Forest Path to the Spring as its coda. 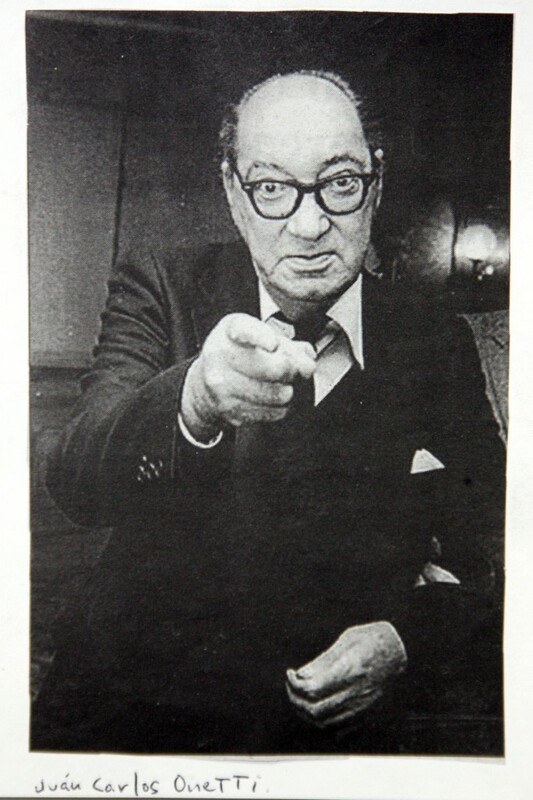 Except for this little gem and Under the Volcano, the grand opus remained a pile of rough drafts and loose notes at the time of his death in 1957. Lowry describes a collection of Manx, Norwegian and Danish fisherman, Scottish boat builders and other odd fellows who lived independent and very private lives in their squatters’ shacks, yet who formed a close-knit community that shared its bounty and discreetly watched out for one another. Each day the novella’s first-person narrator goes to a spring in the woods for water. In Lowry’s hands, the walk and the spring become metaphorical; the novella is about overcoming fear, resisting the intrusion of the past, and tuning out the noise of civilization to achieve happiness. At dusk, every evening, I used to go through the forest to the spring for water. The way that led to the spring from our cabin was a path wandering along the bank of the inlet through snowberry and thimbleberry and shallon bushes, with the sea below you on the right, and the shingled roofs of the houses, all built down on the beach beneath the little crescent of the bay. Far aloft gently swayed the mastheads of the trees: pines, maples, cedars, hemlocks, alders. Much of this was second growth but some of the pines were gigantic. The forest had been logged from time to time, though the slash the loggers left behind was soon obliterated by the young birch and vines growing up quickly. Beyond, going toward the spring through the trees, range beyond celestial range, crowded the mountains, snow-peaked for most of the year. At dusk they were violet, and frequently they looked on fire, the white fire of the mist. Sometimes in the early mornings this mist looked like a huge family wash, the property of Titans, hanging out to dry between the folds of their lower hills. At other times all was chaos, and Valkyries of storm-drift drove across them out of the ever reclouding heavens. Often all you could see in the whole world of the dawn was a huge sun with two pines silhouetted in it, like a great blaze behind a Gothic cathedral. And at night the same pines would write a Chinese poem on the moon. Wolves howled from the mountains. On the path to the spring the mountains appeared and disappeared through the trees. He continues to layer image upon poetic image, with metaphors changing shape and meaning like the mist in the mountains. 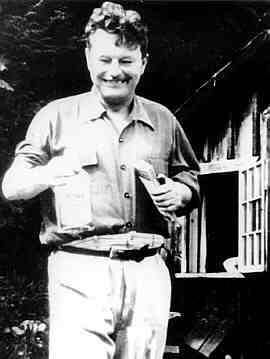 A happy Malcolm Lowry, bottle of gin and book in hand, in front of his shack at Dollarton. More often than not, Lowry’s febrile imagination and unquenchable alcoholism fed a delirious paranoia and self-destructive tendencies, which he captured brilliantly in Under the Volcano. In that novel, as in this novella, Dollarton represented a safe harbor, an idyllic place that could not possibly survive except in dream or memory. The squatters’ eviction in 1954 to make way for a suburban park became for Lowry an eviction from Eden, and an obsession. Though eviction had always been a theme, his writing now took on a more strident ecological protest, unusual in its day, as civilization encroached upon his piece of wilderness. From the moment of his eviction to his premature death at the age of 47 in Ripe, England, he never felt at home again. The Forest Path to the Spring is Lowry’s testament of longing for a place and a peace of mind that he lost. It is beautiful in its affirmations. It should have a greater stature in the English-language canon than it does, and it should be read by more people than it is. Ideally, in autumn, with a fresh pot of tea. Poet Richard Hugo was a native of Seattle, or technically, White Center, an unincorporated neighborhood familiarly known as “Rat City.” White Center is a tough, rundown area of immigrants and low-cost housing, a place feared by many Seattleites as a lawless no-man’s-land of bars and gaming parlors prowled by gangs and prone to random gunfire. In Richard Hugo’s youth, the 1930s, it wasn’t much different–a hardscrabble place where the poor lived. White Center permeates Hugo’s poetry. It haunts his memory; it shapes his language; it colors his moods. Even when he escaped–first into the Army Air Corps as a bombardier, then to the University of Washington under the tutelage of Theodore Roethke, and finally to Montana, where he taught poetry at the university–Rat City was always with him. A friend of mine compares Hugo to Raymond Carver, another Northwest icon. She sees in his plain, hard and hopeless poems fueled by alcohol and persistent depression something akin to Carver’s minimalist stories. But where Carver reveals an occasional ray of hope, an unwarranted grace that might redeem, Hugo’s outlook is grim. 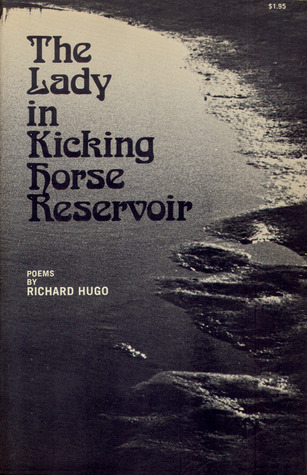 Most of Hugo’s poems are narrative in style, vernacular and unadorned. His is not poetry you will recite lines from, but you will remember its emotional punch long after putting the book away. Though you might want to save reading it for a sunny day.